In April 1905 Harold Ackermann complained in Broadway Magazine that “Statistics prove that fully 85 percent of Manhattan’s three millions and more of inhabitants never enter a place of amusement. The clientele of the Broadway theatre with its prohibitive prices and epicurean repertoire is necessarily limited to audiences that are bound to repeat themselves.” The common New Yorker, he said, could not afford the luxury of the theater. Frederick Thompson and Elmer Dundy had no intention of ignoring the middle classes. They had already created the popular Luna Park in Coney Island 1903. And soon afterwards they turned their focus to Manhattan. With backing by Harry S. Black, head of U. S. Realty and the Fuller Construction Company, the pair designed what would be called the largest theater in the world. Construction began in June 1904 on the site of the 6th Avenue car stables between 43rd and 44th Streets, on the perimeter of the Times Square theater district. 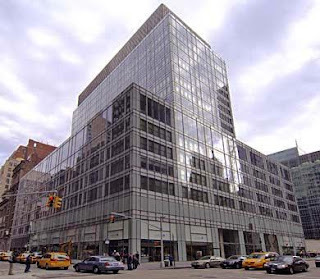 The site was a bit surprising considering the elite men’s clubs and bachelor hotels that had begun rising along 44th Street between 5th and 6th Avenues; including the Royalton Hotel that would abut the new theater. The Times reported the projected cost of the structure to be around $1 million. The completed steel-framed building was clad in brick and marble and its exotic design demanded a list of superlatives. The main auditorium could seat 5,300 patrons—the seats being four inches wider than the normal theater seats “vouchsafed to suffering humanity,” as Broadway Magazine put it. Frederick Thompson, at only thirty years old, was a practical electrician and mechanic with a bent for ingenious inventions. He designed the remarkable stage mechanisms. The stage was operated by a complex system of hydraulics, counterweights and traps. It could be raised, moved, flooded with 4,000 gallons of water a minute for water spectacles, or lowered. The stage could accommodate over 1,000 persons and was a dozen times larger than the average Broadway theater. “On this are produced the water spectacles of whose novelty and beauty the American who has not been abroad has no conception, and it will be devoted, too, largely to the circus department of the enterprise,” said Theatre Magazine. Over 22,000 electric lights lit the stage alone and it required a crew of 196 men to work on and under it during a performance. On April 8, 1905, an auction was held for the sale of boxes for the opening night performance. A. Drake paid a staggering $575 for Proscenium Box L (approximately $11,000 today). Although Harry Black helped finance the project and his firm built it, he paid $525 and $425 for his seats. The total take for the boxes was nearly $10,000. The public got its first glimpse of the interior at the auction. The main auditorium was in the “Roman style,” decorated in Roman red with accents of gold, silver and ivory. “The carpetings are of the same color, and the wall hangings, draperies and upholstery are executed in a Roman red velvet enriched with heavy gold and silver embroidery and tassels,” reported The Encyclopedia Americana. The promenade and lobbies were finished in Caen stone and marble. Off these were the smoking rooms, parlors, waiting rooms and cloak rooms. The Times wrote about the 1909 spectacle that took the viewer on a tour of the world. “We are first taken to a steamship pier in Jersey City, and the end of the scene shows a vast ship steaming away with its three tiers full of people waving their farewells. Then across the river, sparkling with ferryboats, lies New York, illuminated as everybody has seen it at night.” The audience was then treated to scenes of “Tokio,” the Plaza of San Marco in Venice and finally a Maori village with waterfalls and a lake. As the conclusion of that scene “Then the rocks behind the waterfalls disappear and tiers of lovely nymphs are lowered behind the colored waters. It is all wonderful,” wrote The Times’ critic. But by 1919 there were problems. Labor demands, especially by the stagehands, prompted rumors that the enormous auditorium would become a movie or vaudeville theater. Manager Charles B. Dillingham moved to dispel doubts about the venue’s future by announcing the 1919 season would be “open as usual” and “a substantial reduction in prices would be put into effect.” The top price for evening performances was reduced to $1.50; a reduction in some prices of 50 percent. In 1923 Keith-Abee took over management of the Hippodrome and remodeled it, then two years later purchased the building for about $5 million. 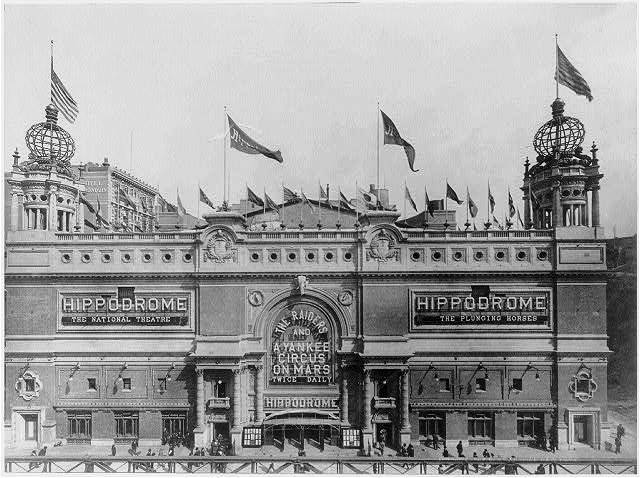 The Hippodrome struggled on for another decade, then on December 16, 1929 audiences were shocked when The New York Times announced that the building had been sold to the Fred F. French Operators, Inc. for $7.5 million. The firm said “that they would erect an eighty-three story skyscraper on the property,” just two hundred feet shorter than the Empire State Building. 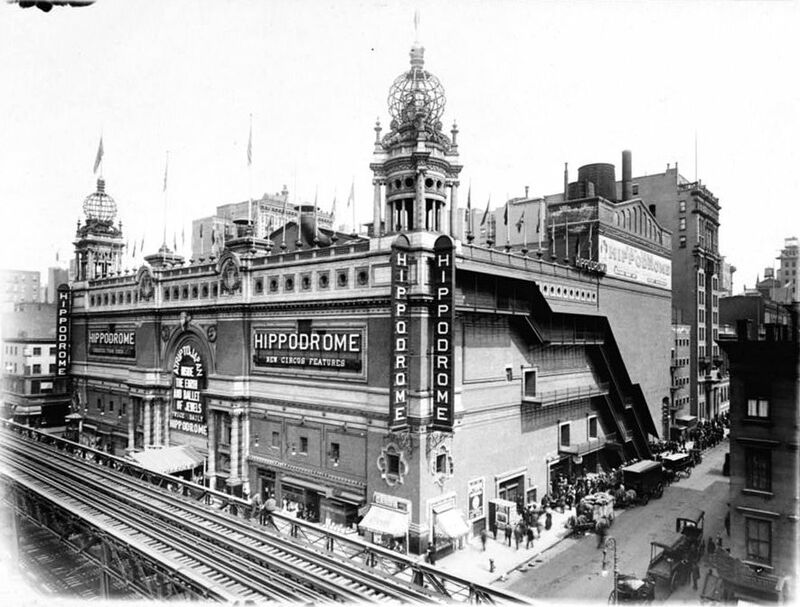 The Great Depression changed Fred French’s mind about constructing the skyscraper and in 1933 the Hippodrome was reopened as the New York Hippodrome Cinema. While it continued primarily as a motion picture theater, live acts like Harry Houdini and his disappearing elephant were presented. Billy Rose’s phenomenal Jumbo was staged in the Hippodrome in 1935. Yet the gargantuan theater would not survive much longer. In August 1939 the doors were closed for the last time. Before the year ended the magnificent structure was gone and the barren lot sat empty, growing weeds and grass, until 1952. Today a sleek glass-and-steel office building sits on the site. Over the entrance doors the name of the building is announced in large letters: Hippodrome. Almost a cruel joke to have the office building carry the same name of the theatre. Spectacular entertainment venue but probably too big to be successful on a yearly basis. It's a shame the theater could not survive, but the current building houses the best public parking garage in Manhattan. ...carved out of the bowels of the theater where the water tank and elephant accommodations once resided. I think I know how you guys feel about the loss of the Hippodrome building! I do really. I like the Diplomat Hotel that was once the New York Elks Lodge #1. It was torn down by great and in its historical place was built a horrible Bank of America. Yea another sky scrapper !!!! I love the Diplomat Hotel and now it's gone. The diplomat was just down the street from the Hippodrome building. The building's were good friends or a set old fellas enjoy just being. Removed for today's greed! Are there any archives from the Hippodrome that might include a recording of Dr. Emmet Fox speaking there? I would love to hear him. Thank you for your help.